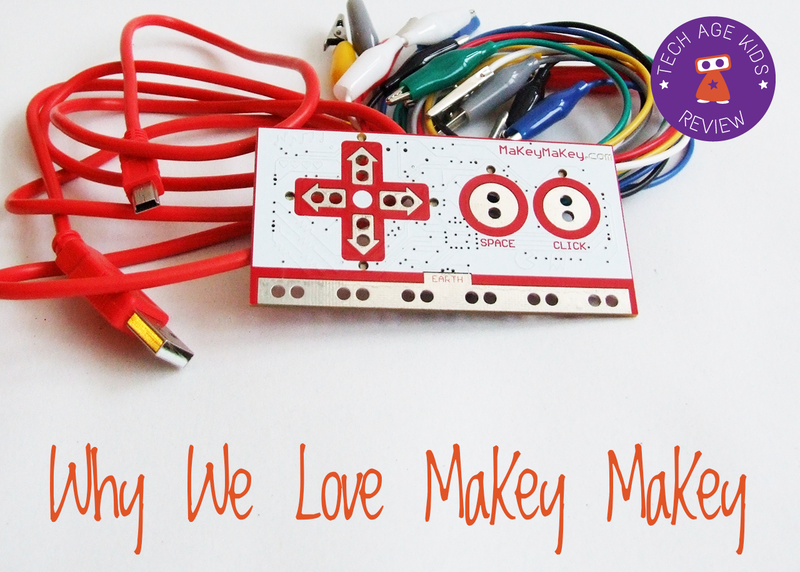 We backed the original MaKey MaKey Kickstarter project. Our board now looks very well-used compared to the shiny new ones we see in nice tins. It's such a simple idea. We've got tons of kid-tech that does fancier things. So why do we keep going back to MaKey MaKey? I've used MaKey MaKey's to teach children at school, to run workshops and hackday sessions, to help Cubs get their Digital Maker badges and in lots of projects with my own kids. MaKey MaKey is an electronics board that plugs into a computer via USB and allows you to turn everyday objects into inputs. You can use it to play Minecraft using kitchen utensils, navigate Google maps with pressure mats, teach your child phonics with tin foil, or make a rocket canvas games controller. Why do we love MaKey MaKey? You don't need any software. This is crucial. You just plug MaKey MaKey in and it acts like a keyboard / mouse via the HID protocol. This is huge. It makes it really easy to use in schools, workshop, and hackdays. It also means you don't hit issues with driver incompatibilities, needing to upgrade to the latest version just when you've got a cool idea or stuff just plain not working. It's simple, but powerful. The clever thing about MaKey MaKey isn't fancy features, it's what kids do with it. Once kids understand the concept they can make amazing stuff without the technology getting in the way. It encourages kids to explore conductivity. Electrical conductivity becomes a very concrete concept with MaKey MaKey. When we first got ours my kids found objects from all over the house to test. Kids love being part of the circuit. There's a real sense of wonder when kids realise that they are part of the electrical circuit that triggers a MaKey MaKey input. It encourages craft + tech. Physical making is really important and is one of the things modern kids miss out on if they have too much screen-time. MaKey MaKey encourages real-world making by connecting it to the digital world. It works with Scratch. The interaction between MaKey MaKey and Scratch is fantastic. It's a fab way to for kids to get more value from their Scratch skills. It encourages design thinking. It really important to for kids to start thinking about designing things for others to use. MaKey MaKey is fantastic for developing those skills. Kids will often have to rethink their design so that it's easy to use. It's accessible. MaKey MaKey is a great piece of technology to use with children (or adults) with physical disabilities. It's also good for getting all kids to think about designing assistive technology. It's practical. You can easily build prototypes and useful tools with MaKey MaKey. It works with Chromebooks. And Linux as well as PC and Mac. It's funny. Banana pianos, musical plants, playing a game with wet wipes! Funny is important.